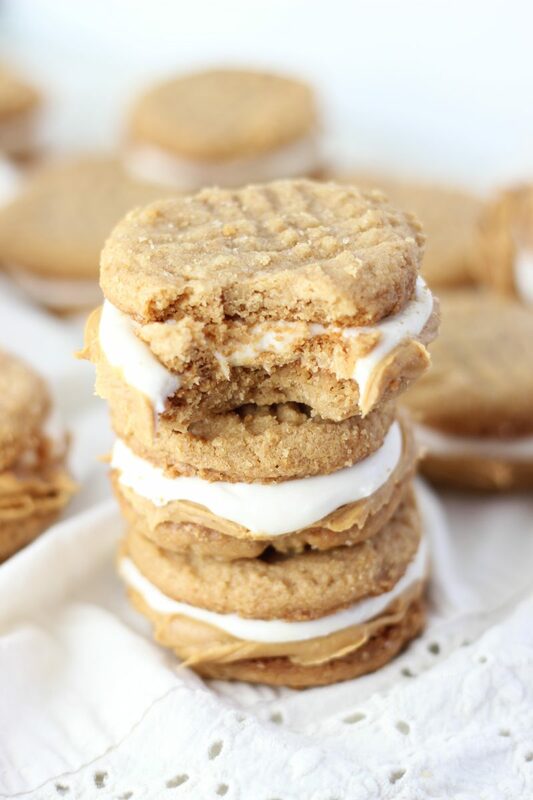 The easiest chewy, 3-ingredient peanut butter cookies, slathered with peanut butter, and a layer of marshmallow cream frosting! One of the first times I ever met my in-laws, they were hosting us for dinner. My S.O.’s step-father was challenging me on my baking skills, being the ball-buster that he is. He asked me what I could make right on the spot. Okay, that’s a difficult task. How many recipes do you know off the top of your head, start-to-finish? And that take minimal ingredients? 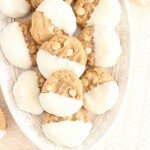 If you ever find yourself in a similar predicament, which I can’t imagine would happen, but still, these easy 3-ingredient peanut butter cookies are what you make. 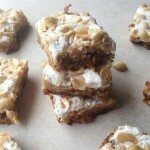 They are what I made, and everyone was thoroughly impressed. 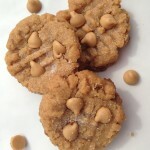 The dough takes about 2 minutes to mix up, and these are the most peanut-buttery peanut butter cookie you can find. 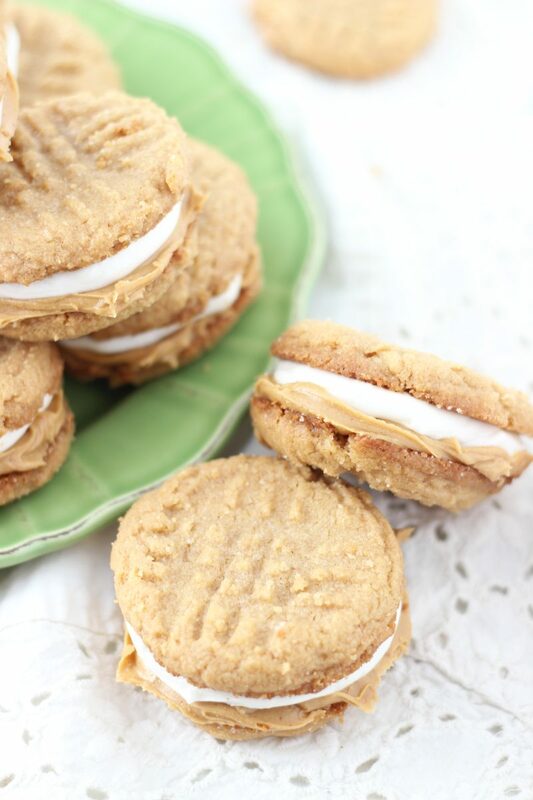 When I wanted to make Fluffernutter Cookie Sandwiches, I knew what peanut butter cookie recipe I was going to use. It’s a no-brainer. I mixed up the standard cookie recipe, but doubled it. This recipes makes 18 large cookie sandwiches. I slathered one bottom of a cookie with a heaping tablespoonful of peanut butter, and covered the bottom of a second cookie with marshmallow cream frosting. 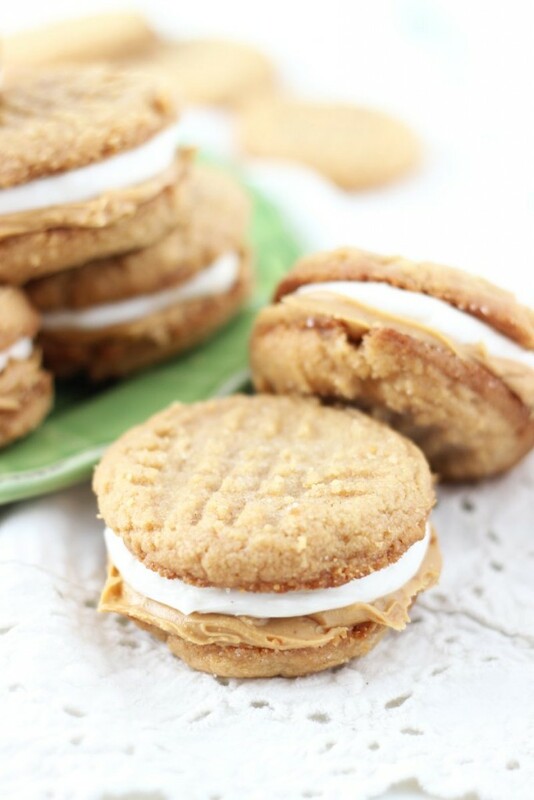 Put them together, and you’ve got super delicious marshmallow and peanut butter Fluffernutter Cookie Sandwiches. I love anything fluffernutter. Let’s talk about the marshmallow frosting. It’s what my Grandma always uses to fill two cake mix chocolate cookies to make her own homemade version of Oreos. Her homemade Oreos are amazing. We love them, and grew up on them. However, fair warning that the marshmallow frosting is kind of a pain to make. 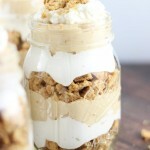 You know how marshmallow fluff sticks to everything. In this recipe, you beat it in the mixer with powdered sugar to get it thick enough that it won’t run or stick. You actually want it to be almost like a dough – you can roll it into balls, and press it into the center of the cookie sandwich. Working with sticky and gooey marshmallow fluff, and getting it to that point in stiffness, it takes some elbow grease, just so you know that going in. Sometimes it’s even taxing on the mixer. I occasionally need to add more powdered sugar by hand, kneading it in. Yeah, it’s work. Also, I don’t really recommend eating the marshmallow cream frosting on its own. It’s not the best by itself. In the middle of two cookies though, it’s absolutely perfect. 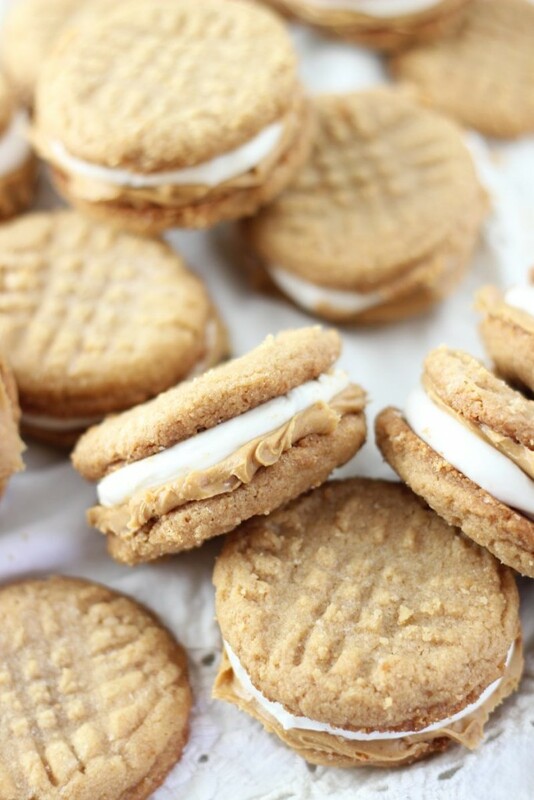 Especially in this recipe because we pair it with plain peanut butter as the filling for the cookies, and the saccharine marshmallow frosting is a nice balance to the much-less-sweet peanut butter. 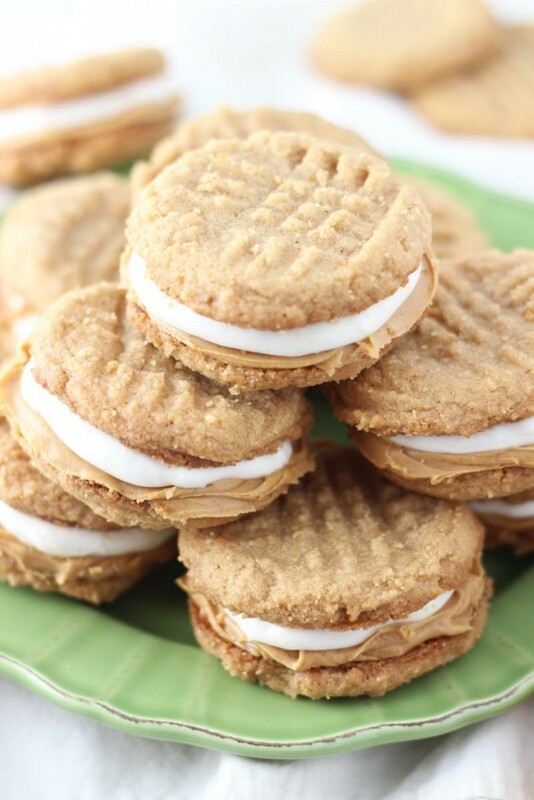 I know I’m underselling the marshmallow frosting, but it’s beyond perfect for these cookie sandwiches. We’ve been making it for homemade Oreo filling for years! Just know that it takes elbow grease to mix it up, and that it doesn’t taste great on its own. 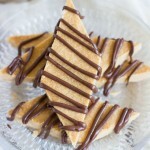 It needs to be in the middle of a cookie, but then it’s perfection! 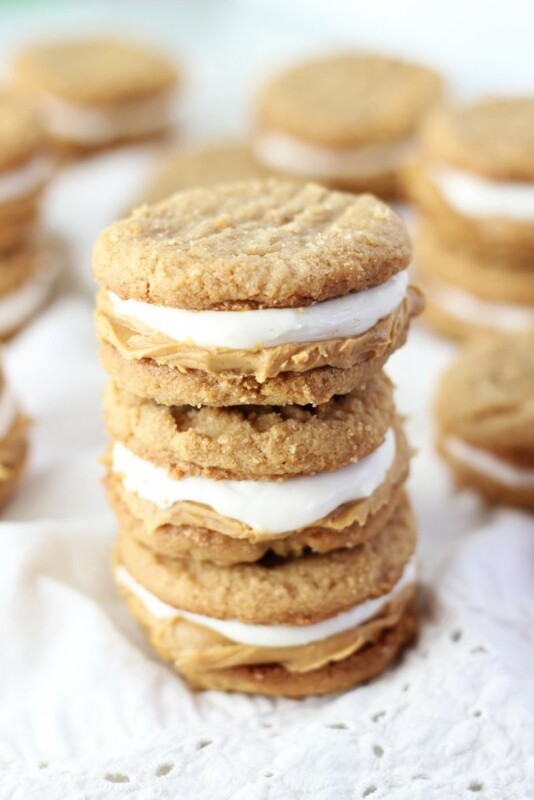 As is this Fluffernutter Cookie Sandwiches recipe, featuring one of my favorite pairings – peanut butter and marshmallow!